So far I have resisted the tempting display of Girl Scout cookies at the entry of the grocery store. Growing up, my mom always bought thin mints and tag-a-longs so it wasn’t until I was an adult that I really got to appreciate the perfect flavor combination of the Samoa cookie – a buttery wafer coated in caramel, coconut, and chocolate. YUM. Don’t get me wrong, I still love the thin mints too, I just have two favorite Girl Scout cookies now. While I may have made it past the stocked tables brimming with colorful cookie boxes, it only resulted in my need to whip up my own version of the treat – a Samoa Granola Bar. Since I prefer my granola bars chewy, I used the oven only to roast the oats to combat their raw flavor and to toast the coconut. The remainder of the prep was simply mixing and pressing into a greased 8-inch x 8-inch dish and letting the bars chill overnight to firm up. I do recommend chilling them overnight, as only a few hours of chilling results in more crumbling. The Samoa granola bars turned out every bit as chewy as I had hoped, and taste like their cookie inspiration. I also barely swatted my husband away to grab photos of the finished dish. Thankfully I managed to take a few pictures of the Samoa Granola Bars before they were declared “awesome” and devoured. 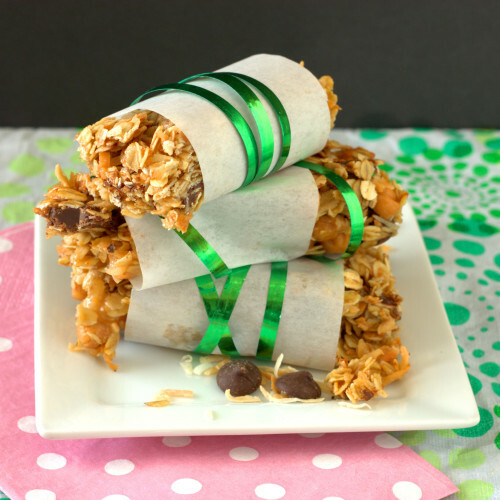 While they are a bit more decadent and gooey than I would typically make for a hike or snack, they are a great way to make a gluten-free treat that will satisfy your sweet tooth and your hankering for a Girl Scout cookie. Preheat oven to 350 °F. Line an 8-inch x 8-inch pan with foil and spray with cooking spray and set aside. 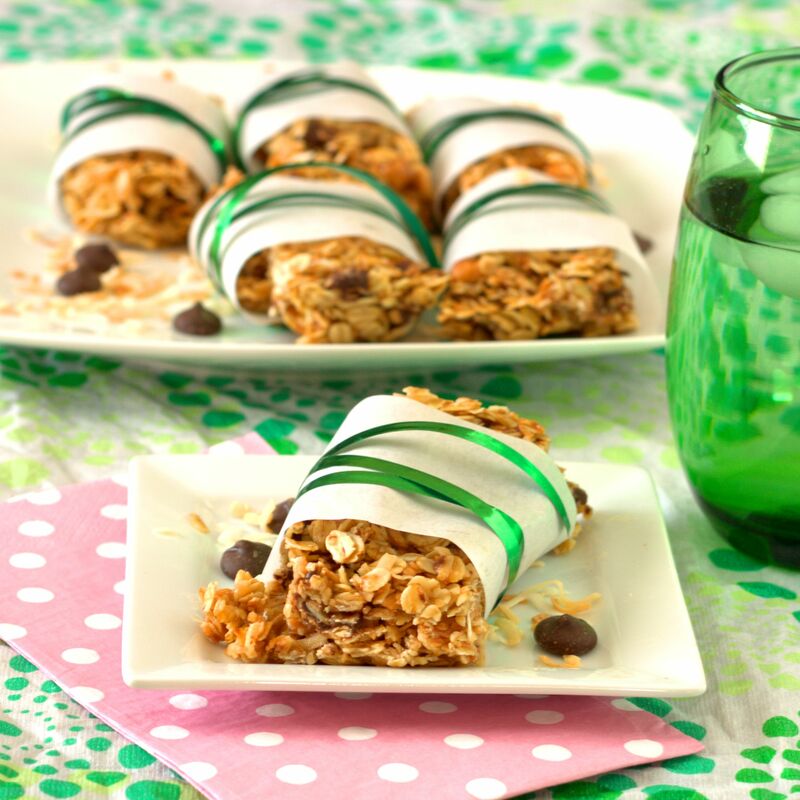 Spread the oats on a large rimmed baking sheet and the coconut flakes on a second rimmed baking sheet. Put both sheets in the oven, baking the oats for 15 minutes and the coconut for 10 minutes or until lightly browned, stirring both twice during baking. Remove the oats and toasted coconut from the oven and add to a large bowl; set aside. In a small bowl, stir together the honey, butter, salt, and vanilla extract. Pour the honey mixture over the oats and coconut and stir to coat. Add in the caramel bits and chocolate chips and stir until combined. 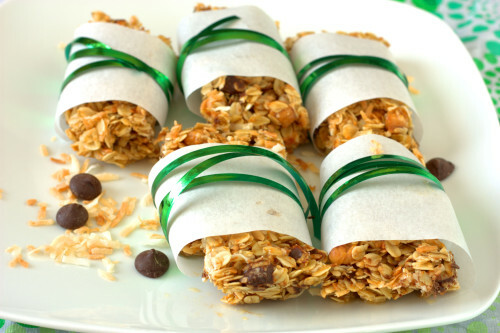 Press the granola mixture into the foil-lined pan and chill in the refrigerator overnight. Lift the bars from told the dish using the foil and cut into 8 bars; serve or store in refrigerator until ready to eat. Note: I used old fashioned rolled oats which did result in some crumbling. Jenn from onceuponachef.com suggests using quick cook oats to reduce crumbling. This entry was posted in Breakfast, Dessert and tagged chocolate, coconut, gluten-free, snack. I think you need to join the Girl Scouts with this recipe. Love this version and homemade is always best! Thanks, Kelly! I wonder what badge these granola bars would earn . . . Thanks, Kristen. 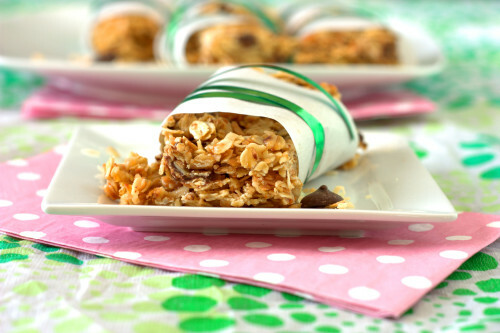 This recipe has me thinking of other fun ways to make granola bars! such a great idea – LOVE this! I am puzzled by the “caramel bits”. What do you use? I love caramel but haven’t seen caramel bits in the baking aisle.